This past week, in El Paso, Texas, FASF 1st VP, Dr. Kathleen Martín (R), discussed the upcoming Centennial of the Birth of American Air Power with U. S. Army Colonel Carey Wagen (L), Commander of the U. S. Army’s 1st Armored Division’s Combat Aviation Brigade (“CAB”). 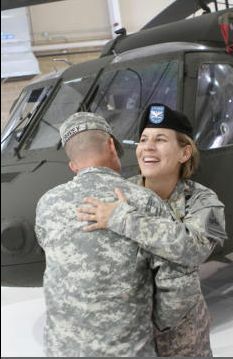 At Left, is Colonel Wagen, being welcomed to her new command at Fort Bliss’s Biggs Army Airfield two years ago. A combat helicopter pilot, the Colonel is only the second woman to command a combat aviation brigade in the history of the U. S. Army. Prior to taking command of Ft. Bliss’ CAB, she was the Deputy Director of Aviation operations for Army Forces Command at Fort Bragg, N.C. Colonel Wagen has deployed twice to Afghanistan and is presently overseeing some of her Brigade’s operations in Africa, where they are taking care of logistics for the U. S. aid project to assist in the Ebola outbreak. In her private life, the Colonel is an enthusiastic aviator, as well, often flying her own family four place experimental canard winged aircraft with her husband and two young sons. The Colonel’s husband is also a retired Army aviator. A few Medical Air Evacuation Helicopters of Colonel Carey Wagen’s 1st Armored Dividion’s CAB at Ft. Bliss, Texas. 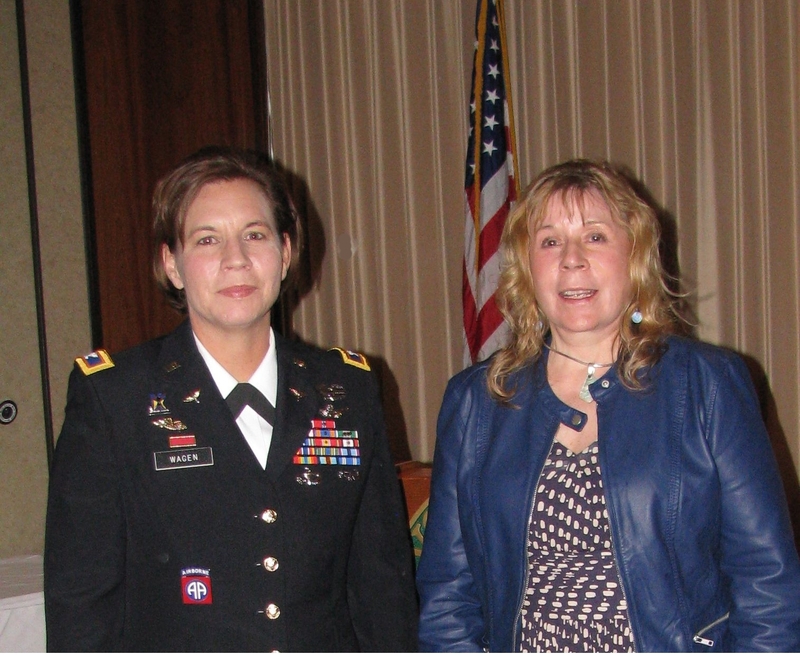 Your FASF Aerodrome Staff captured this photo of Col. Wagen (Right) during her presentation to a group of former Military Aviators in El Paso, at which she described her unit’s mission, present achievements and coming challenges. Before coming to Fort Bliss, Col. Wagen commanded the 2nd Battalion, 82nd Combat Aviation Brigade. Previously, she served in leadership and staff positions all the way up to Battalion Commander at the 82nd Airborne Division Headquarters. The Colonel earned her Master’s Degree in strategic studies from the United States Army War College and is a graduate of the U.S. Army Command and General Staff College, as well. 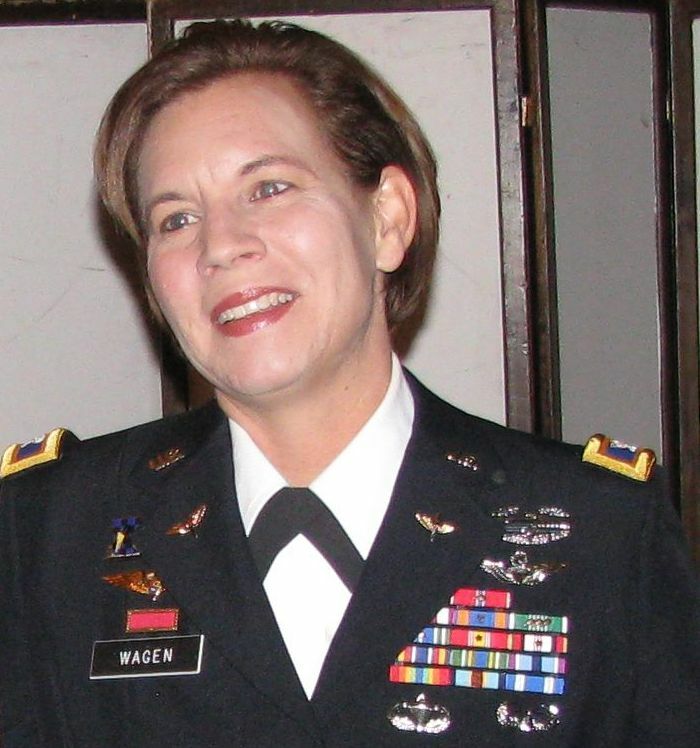 The Colonel obtained her officer’s commission in the Army after her graduation as a Cadet in the Army ROTC program during her undergraduate years in Florida, her home state. Colonel Wagen’s awards and decorations include the Bronze Star Medal (with Oak Leaf Cluster), Army Meritorious Service Medal (with two Oak Leaf Clusters), the Air Medal (with Oak Leaf Cluster), the Army Commendation Medal (with three Oak Leaf Clusters), the Army Achievement Medal (with five Oak Leaf Clusters), the Humanitarian Service Medal, the NATO/ISAF Medal, Master Aviator Badge, Senior Parachutist Badge and the Air Assault Badge. This entry was posted in AVIATION NEWS on February 23, 2015 by FASFRIC.